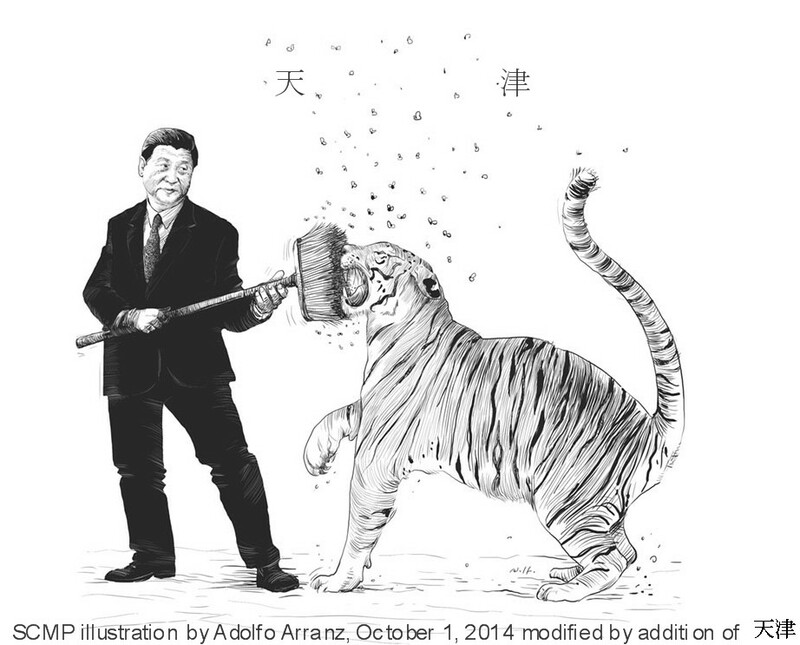 President Xi Jinping’s anti-corruption drive — known for its signature vow to target both ‘tigers’ (top-level officials) and ‘flies’ (low-level functionaries) — shows no sign of abating. It may even be gathering momentum with the early April announcement that former Politburo Standing Committee member (and security portfolio chief) Zhou Yongkang will be standing trial in Tianjin on charges of bribery, abusing power and disclosing state secrets, This announcement followed a slow-motion public ensnarement of Zhou as, for almost two years, a tightening noose methodically drew in business associates from Zhou’s time with China National Petroleum Corporation, provincial associates from his time as Party Secretary in Sichuan Province, associates from the security establishment and close family members. As a member of the PSC for five years from 2007-2012, Zhou Yongkang was one of the seven most powerful people in China. Not since the 1976 arrest and subsequent trial of Jiang Qing and the Gang of Four at the end of the Cultural Revolution has such a high-level Chinese official been brought to public trial by the Chinese Communist Party. The beginning of Zhou Yongkang’s fall is associated with Chongqing, a provincial-level ‘city’ (see Direct Controlled Municipalities) in China’s far west immediately adjoining Sichuan Province and erstwhile power-base for Bo Xilai, Zhou’s protégé. Until the death of British citizen Neil Heywood followed by the failed attempt by Bo’s police chief to seek refuge in the U.S. Consulate in Chengdu (capital of Sichuan Province) followed by the conviction of Bo’s wife on charges of ordering Heywood’s poisoning, it had appeared likely that Zhou would be able to get Bo onto the Standing Committee, thereby protecting his ‘retirement flank’ after stepping down. Bo’s candidacy faltered under the weight of these events just as Xi Jinping was consolidating power and his new Standing Committee taking final shape. And now, to add to Tianjin’s notoriety, the city’s former mayor, Dai Xianglong, is “cooperating” in an “investigation”. From 1995 to 2002, before becoming Tianjin’s mayor, Dai was already well-known as the governor of China’s central bank, the People’s Bank of China (PBoC). The investigation, so far, is focused on the vast wealth amassed by Dai’s relatives, not on Dai himself. But this may well be just a tactical move with Dai himself as the real target. This new investigation comes on the heels of the 15 year prison term meted out to Nanjing’s former mayor, Ji Jianye, for corruption. The court found Ji guilty of accepting 11.3m yuan ($1.9m) in bribes between 1999 and 2013, when he was dismissed. President Xi Jinping’s anti-corruption campaign aims at trying to clean up China’s graft-riddled government at every level, with examples being set at the top. And so far, we have to say it is successful. In our experience, government officials as well as executives in state-owned enterprises (SOEs) are all keeping their heads down. No big banquets, no gifts – given or received – and strictly limited international travel are basically the norm, at least for now. The question is – will this nationwide campaign eventually help China’s economic development? We hope so. Here is some very recent China market news taken from a variety of public sources. These then are the dangerous riptides which have been tugging at our PHL-TEDA EcoPartnership‘s Chinese partner, TEDA, since the end of 2014. Given the fathoms-deep nature of Chinese political and legal process, many of these currents have been swirling in hidden depths while the surface continued to appear placid. The U.S. side of our PHL-TEDA EcoPartnership has unmistakably felt the power of these currents, though. I feel overwhelmed by the politics and bad news on the environment. Thank you for helping a bit with that. « 羊年快乐！ Happy Year of the Sheep (Ram) … or the Goat?